Jonas was a fantastic guide! From start to finish he was professional, picking us up on time and having a well organized but not rigid itinerary. His detailed knowledge of anthropology, archaeology, and the history of the area made the tour a very memorable and informative one. In retrospect a visit to Teotihuacan without a guide would have been far a less enjoyable and enriching experience. If your travels take you to Mexico City I would highly recommend checking Jonas' availability!! What a great trip! Jonas made our trip to Teotihuacan incredible. He's great explaining all the history and relevant details of the pyramids. Without him, it would have been very easy to overlook critical information. We had a delicious lunch after our trip and we always felt that Jonas went above and beyond. We hope we have the opportunity to travel with Jonas again. Thank you Jonas! friends & i were very pleased w/ jonas's services. he was prompt, curtious, accommodating & knowledgeable. all things you want in a guide. his van was very clean & comfortable, important as our drives were long, 3.5 hrs. thank you jonas for a wonderful monarch butterfly experience. take care & all the best! TOUR GUIDE RESPONSE: Thank you for the nice comment, hope you enjoy your further travels and keep on reporting, me just back from a 5000km drive with guiding! Amazing guide and very knowledgeable. Really enjoyed our day in Xochimilco seeing the markets and the canals. Would highly recommend this tour guide! TOUR GUIDE RESPONSE: Thanks Christian, nice to hear you enjoyed also your own explorations based on my recommendations! Had an awesome experience! Jonas was very knowledgeable and we enjoyed not only learning about Mexico but learning about him too! TOUR GUIDE RESPONSE: Loved rediscovering your roots with you! Jonas was an absolutely incredible guide. He made our experience above and beyond anything we could hope for. I take a lot of private tours when I travel and Jonas was one of the best tour guides I've had anywhere. We spent most of our day at the Anthropology Museum. We didn't just see artifacts at the museum, Jonas brought the movements of the different groups of people across geography and through time to life - their interactions, politics, belief systems, art styles. It was both memorable and fascinating! I'm already talking to people about returning to Mexico City and hiring Jonas. TOUR GUIDE RESPONSE: Thanks Carol, fascinating to be with such interested people like you, see you back soon! Jonas is an excellent tour guide. My family of 5 thoroughly enjoyed our trip with him to the pyramids. He is so knowledgeable about the area and answered all our questions. Jonas picked a great lunch spot with some Aztec items on the menu. He navigated the traffic patiently and expertly. The pace of the tour was just right. And Jonas is fun to be with which made the day so enjoyable. Don't think twice about booking a tour with him. It's worth it. Jonas was excellent! He was very knowledgeable about everything we saw at the Anthropology Museum and the Templo Mayor, accommodating, and all around fun to be with. He started the tour by giving us options depending on what we wanted to get out of the tour in terms of number of sights, amount and depth of historical information, etc. He also took us to an excellent place for lunch and even gave us great suggestions for our trip to Puebla. We'll definitely find him again when we're back in Mexico! This was a superb tour... beautifully crafted, taking us through the long history of the pyramids. We spend a almost whole day with Jonas and he is one of the best tour guide we ever had.He went to great lengths to provide us with experiences much beyond expectations. Thank You Jonas and keep up a great work . Jonas was an ideal guide for our small group. We did a Centro Historico tour with him that hit very interesting cultural, food and architectural high points that was the perfect balance with high level overview peppered with the kind of detail you wouldn't see on your own. We recommend him for being easy going, loaded full of knowledge for his adopted home, and ability to observe our interests and bend the day towards them. TOUR GUIDE RESPONSE: Thanks, enjoyed my time with you, let's hope we can spend more time together on your next visit, to explore more hidden wonders of this city! We rate Mexico City and surrounding with Jonas V. 5 out of 5 The itinerary is excellent. It offers variety of Mexico experience ie. City, historical , cultural , food , market .. The Guide , Jonas V.. He was a stickler of punctuality ,.talk not too much and not too little, very helpful with all communication with the locals and the best is he sticked to the programs regardless of the time. We enjoyed Mexico City tour guided by Jonas V. very much. TOUR GUIDE RESPONSE: Thanks for your kind comments and happy continuation of your travels in Mexico! Jonas was punctual, polite and professional. He is very knowledgeable about his subject, explained facts in a fun and interesting way and made may things come to life for us. We definitely recommend him and will be looking for him the next time we are in the area too. TOUR GUIDE RESPONSE: Nice to be with you, hope you'll be back soon! Jonas, provided us with a WONDERFUL tour and time. He was flexible and attentive to our needs. We asked LOTS of questions and Jonas provided full and informative answers that were welcomed and increased our understanding of the culture, monuments and people of Mexico. His suggestions for rest stops, exhibitions and architectural sites were unanticipated bonuses. Jonas is a people person, with experience that makes touring with him a delight. Such a pleasure to have had Jonas as our tour guide. He has a thorough understanding of all the different pre-Hispanic time eras and how they all fit together to form a continuance. With his easy manner and his willingness to share information freely, the broader picture and understanding for certain historical contexts was created to form the base of our information and understanding Mexico - even in the modern areas! Well worth a try! The 6 hour walking tour was a bit much for us. We probably should have broken up the tour into 2 days. That being said, we covered the most important buildings in historic district and ate street food and visited a market. Jonas was friendly and easy to talk with. Amazing Tour guide with knowledge of everything, made out trip incredible. We had a 6 month baby, and was absolutely accomodating. TOUR GUIDE RESPONSE: Thanks Francisco, it was a pleasure to reconnect you with the country of your ancestors. Be safe and hope to see you again in the future! TOUR GUIDE RESPONSE: Hi Irvine, glad you enjoyed the tour, thanks for your patience in dealing with the traffic. Jonas was our guide for the city and this pyramids tour. Even though he has probably been to this site many times, he took his time and went through the notable stops and gave us so much more context to how these pyramids were built and used. He walked us around the told us the many stories behind them and made it so much more enjoyable and engaging than just looking at them. He even took us to a great restaurant nearby and we enjoyed lunch with a view of the pyramids. Hire him if you want a good day. TOUR GUIDE RESPONSE: Thanks for your genuine interest and enjoyable company. Hope to see you guys back soon! This tour with Jonas was a great. It was off the beaten path tour that we wanted since we had walked around the more touristy spots the day before. Jonas is very knowledgeable and answered our questions thouroughly. We even went to hidden gems and had exotic tacos and drinks for a nice break. All in all we are so happy to have such an experienced and certified guide taking us around! Tour was great! Jonas was very knowledgeable and accommodating. TOUR GUIDE RESPONSE: Thanks for your nice review, despite the fact that I was only at half of my capacities due to stomach problems..
Jonas is an excellent tour guide, and we had a great time on this tour. Seeing the Cathedral and surrounding area was very moving. Following that with an extensive tour of the pyramids and grounds at Teotihuacan, we felt immersed in centuries of Mexican history. We ended with a delicious, local lunch and thoroughly enjoyed ourselves! Gracias, Jonas! Jonas was extremely knowledgeable and also knew some tricks to manage the crowds. Highly recommend. He also took us to a fantastic lunch spot. This was a really fun day, from the Pulque tasting, to the tour and purchase of a picnic lunch in the local market, to the boat ride itself. We had a fantastic time, felt very well cared for by Jonas, and really enjoyed this beautiful local experience! Don't miss this trip, you'll love it, laugh a lot, and learn quite a bit about local Mexican culture. Jonas, what a perfect day you provided for us! Very glad we booked with Jonas. We got so much more out of the museum visit than by ourselves. Jonas was understanding of our special needs and tailored the tour for us on the spur of the moment. Especially liked our bus rides and intro to the metro. We were able to ride it for the remainder of our visit like pros! Drinking pulque was a treat, as was shopping in a local market. Thanks Jonas! TOUR GUIDE RESPONSE: Thanks Pamela, it was a pleasure to explore Mexico City's treasures and underbelly with you! Jonas V was enjoyable, friendly, tireless energy, good knowledge and prompt. We had a great time with Jonas. He is knowledgeable and made the tour special and informative. Well done! Jonas was a truly reliable and thoughtful tour guide. He provided us with great advice on what we should see, and was always flexible and worked with what we wanted to do. My fiancee, her 9 year old daughter and I felt very safe the whole trip. Jonas is very knowledgeable regarding all the sites we visited, and of Mexican history and folklore. I highly recommend Jonas as a tour guide. Excellent Tour.....and the best recommendation for lunch and shopping for tequila !!!!! Excellent tour and wonderful day with great stops along the way !!!!! I very much enjoyed Jonas' tour of the pyramids. We learned and experienced so much in a day. Jonas has an abundance of knowledge and is very good company. Highly recommended! We spent a day with Jonas visiting Teotihuacan and Tula. Jonas has an impressive knowledge of Teotihuacan and Mexico in general. This was my first time visiting Mexico, and we learned a great deal from Jonas about Mexico's pre-colonial history. We thoroughly enjoyed our day out, and he worked hard to get us through the crazy Mexico City traffic in time for our dinner reservation. I would highly recommend Jonas as a tour guide for a visit to Mexico. Jonas is a true professional yet being with him is like visiting a friend showing you his neighbourhood!Punctual,always accessible & speaks perfect English.His car is new/comfortable.His passion/knowledge of Mexican culture & people made our experience great.He explains history in a way that opens discussion.Doesn’t deliver his tours by rote & offers an alternative of meaningful,active learning.Open to questions & eager to share knowledge,he never hurried us & kept things moving to experience everything. TOUR GUIDE RESPONSE: It was a pleasure to share and interact with such experienced travellers! Everything we saw was enhanced by Jonas' knowledge of the subject. He can read his clients and know when to move forward and when to hold back. We had a wonderful tour. TOUR GUIDE RESPONSE: Thanks for appreciating my effort to customize your tour, hope you had a wonderful continuation of your México City trip. Jonas managed to give us a wonderful overview of the delights of Mexico in the short 3 days we had available. He tailor-made a trip for us a week before our travel which exactly met our requirements. We had a mix of museums, churches,, street and gastronomic food, ruins, exercise (Hierve el Agua)!, and visits to a pottery, and rug weavers' workshops. He stayed with us during the evening and could have gone on much longer than us. Accommodation was perfect, and his vehicle comfortable. Well recommended! TOUR GUIDE RESPONSE: It was a pleasure to make your introduction to Mexico a success and help you out with your further travel plans! An excellent, enthusiastic, knowledgeable guide with a wide range of interests which he willing shares to the delight of his clients. Jonas is a fantastic tour guide. He has an in-depth understanding of Meso-American cultures and the history of the Spanish conquest. I greatly appreciated his knowledge and insights on these subjects. He also is very knowledgeable about good quality foods and drinks. I had a great time with him and felt very comfortable. I highly recommend Jonas to be your tour guide. TOUR GUIDE RESPONSE: Thanks Jerry for appreciating my wide fields of interest. We'll be in touch. Jonas is very knowledgeable and interesting. It was a pleasure having him guide us in Mexico City. 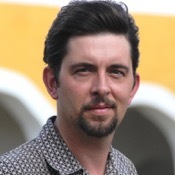 With a Masters in Anthropology and a confirmed Mexican history buff, Jonas is a wealth of info and knowledge! He will take you to the main historical sights and to a few secret treasures. Great energy and enthusiasm. 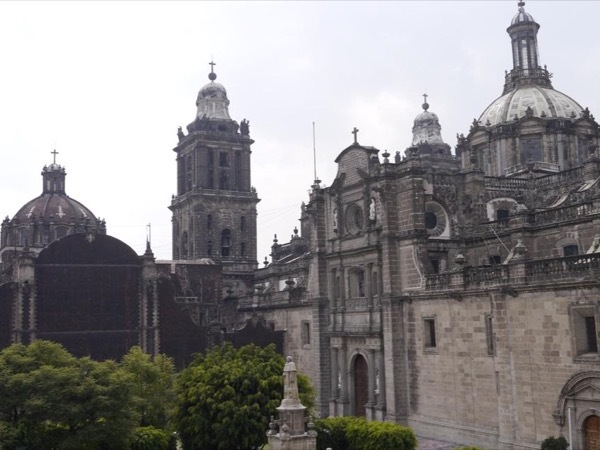 You will understand Mexico and Mexico City in a deeper way after this tour! We recently had the opportunity to enjoy both a cooking class and tour of Teotihuacán with Jonas. He is a wonderful guide --- intelligent, enthusiastic, with the heart of a true explorer! Jonas is conscientious and accommodating and truly went the extra mile to ensure that our group (five adults ranging in age from 23-58) had a unique and thorough experience. Thank you! TOUR GUIDE RESPONSE: Well, you nicely summed up what I strive for as a guide, glad it came across! It was a pleasure to receive such a fun group! Jonas was an excellent tour guide. He was able to answer all our various questions about Mexico City and Teotihuacan Pyramids. He was very interesting and laid back. I would highly recommend him and this tour for anyone. TOUR GUIDE RESPONSE: Thanks Tony, glad I could keep you interested after so many hours of flight. Hope you enjoyed the rest of your time in Mexico City! On Apr 28, we had the pleasure of Jonas as our tour guide. We did the hike in Tepoztlan, explored the Xochicalco ruins and the Cacahuamilpa caves. Thank you so much for such great memories of Mexico and your knowledge and insight of where we went. If we come back again, we will book with you again. Brian is still expecting the drive back to Canada. Till next time! Jonas is wonderful and we would definitely have other tours with him. We couldn't visit Xochicalco (the reason why we booked this trip) because of a local protest, so this was our only tour in Mexico where we couldn't meet our expectations. Despite of this problem, Jonas was very nice in offering us a selection of alternatives and we could spend a very pleasant day with him. Jonas is an outstanding tour guide and we highly recommend him. We engaged him for a tour of the Teotihuacan pyramids. We had an interesting and informative tour of the pyramids, the mural museum and the residence excavations. Jonas was very knowledgeable of the history of the pyramids and the archaeologist's changing theories and techniques over the years. He is very personable and it is enjoyable to spend time with him. He is very fluent in English and was right on schedule. He is a perfect tour guide. TOUR GUIDE RESPONSE: Wow, I can hardly think of a more flattering testimonial, thanks Hop, hope to see you again soon! We had a great tour to the pyramids and to dinner with Jonas. He was great with my three kids, stopping for snacks and letting them sample local palm juice, and made it fun and easy for us to enjoy our 8 hour layover in Mexico City. His knowledge allowed us to truly appreciate Teotihuacan and was just the right length for the kids to have fun without getting too tired. He also gave us some tips for exploring the city when we came back through on our return trip. TOUR GUIDE RESPONSE: Thanks and hope you feel like spending more time in Mexico City or Mexico next time! Jonas was very personable and knowledgeable. We enjoyed both his company and the tour. He allowed us to set the pace for the tour and answered our numerous questions with detail and patience. Throughout the tour, he explained to us how the consensus among archaeologists has changed over the years, so we had a good sense of what was known and what is not yet understood about Teotihuacan. We plan to return to Mexico and are certainly going to ask Jonas again to be our tour guide. TOUR GUIDE RESPONSE: Thanks for your nice appraisal, hope to see you back soon! I am so glad that we had the wonderful Alejandra for our tour of the National Anthropology Museum. Our group of twelve could have been quickly overwhelmed by the scope of the collection, but Alejandra kept us engaged for three hours---her narrative was so interesting and added complexity to our travels in Mexico. An added plus was Alejandra's van and superb driving, so the dozen of us could stay together. She also was able to provide transportation for us to wedding events and the airport. TOUR GUIDE RESPONSE: Thanks Dena, I am glad Alejandra was able to step in for me, to your satisfaction. Not very good had to ask him questions before he would start talking. Made for a good story but car got towed and I had to give the extra money to pay off the police, never got it back. Kept walking away from us during the tour, not impressed. I would use your service again to get the one on one service, but not Jonas. TOUR GUIDE RESPONSE: Unfortunately, there are days when multiple things go wrong. After lots of traffic and finding a last minute replacement car, it got towed away by a corrupt police man. I'm glad to refund you for your help to get it back, as I didn't find any ATM during our time together. I hope the effort made to add extra visits during the tour make up for the drawbacks! It would have been nice to acknowledge you appreciated the extra graveyard we visited. TOURSBYLOCALS RESPONSE: We got in touch with the guide and his guide manager and the guide was advised on ways to avoid situations like the one mentioned above of happening again. TOUR GUIDE RESPONSE: Glad you could still have the bike experience and thanks for your nice words! Great knowledge and detail and we appreciate his flexibility since we had to make changes. Let Jonas immerse you in the culture, food and drink and you will enjoy the experience immensely! TOUR GUIDE RESPONSE: Thanks for the nice recommendation! Great tour guide. Took a lot of interest in personalizing the trip to match our interest. Very knowledgable and passionate as well. TOUR GUIDE RESPONSE: Thanks, nice to have such an interested audience and to go in-depth! We really enjoyed our cooking tour and class; Jonas is very knowledgeable and shared tips not only on cooking but travel in Mexico in general. We loved every bit of the day; buying the ingredients, snacking on tostadas at the market, tasting the Mezcal, cooking and especially enjoying the fruits of our hands afterwards. This really helped us appreciate the vast variety of Mexican food since it was one of the first things we did and we felt more apt @ choosing meals. Definitely a must-do in Mexico city! Jonas went above and beyond our expectations! His tour was loaded full of information. He is extremely easy to work with and open to our requests and suggestions. We enjoyed this tour very much! If you want a first rate guide with a deep knowledge base then I highly recommend him! TOUR GUIDE RESPONSE: Thanks for your nice comments, Jeremy. I thoroughly enjoyed having such interested and motivated people on board and was happy to fit and complement the tour to your requests. Hope to see you back soon! El tour con Jonas a las pirámides de Tehotihuacan fue muy bueno. Tanto las explicaciones del sitio por Jonas, como el vehículo de transporte fueron muy buenos. Las informaciones que recibimos fueron muy completas. Vimos muchas zonas con detenimiento y el tiempo dedicado fue el adecuado. Quedamos encantados con el tour. Our guide Alexandra was wonderful. She was more than accommodating with our needs. We had an array of ages in our group (15-75) and she made sure we were all taken care of. I would take another trip with her and would specifically request Alexandra. Her knowledge was expansive and she answered all our questions. Thank you so much for a wonderful weekend. TOUR GUIDE RESPONSE: Thanks for choosing us, I am glad you liked the program I made up for you and the good care Alejandra took of you!